A psychological horror film with some elements of humour, Get Out builds some fine tension but then surrenders to a rushed and bloody climax. 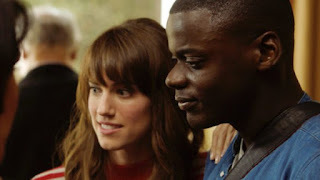 Aspiring photographer Chris Washington (Daniel Kaluuya) is black, his girlfriend Rose Armitage (Allison Williams) is white, and they are about to embark on a weekend trip to visit her parent for the first time as a couple. 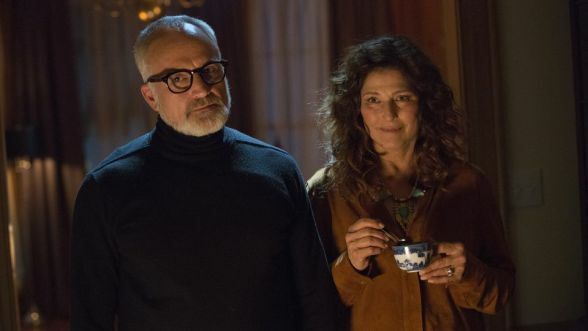 Dean and Missy Armitage (Bradley Whitford and Catherine Keener) live out in the suburbs and espouse liberal views, but Chris notices the strange, subdued behaviour of their black groundskeeper Walter (Marcus Henderson) and black maid Georgina (Betty Gabriel). Missy is a hypnotist and offers to help Chris quit smoking. He reveals his childhood trauma surrounding his mother's death in a hit and run accident and Missy tricks Chris into an an unsettling experience in the hypnosis chair. Dean and Missy host a weekend gathering for their friends, who all appear to be elderly white people with health problems, including blind arts supporter Jim Hudson (Stephen Root). The one black guest at the party is Logan King (LaKeith Stanfield), whose strange demeanor adds to Chris' anxiety that something is very wrong in this idyllic suburb. Written and directed by Jordan Peele, Get Out is a compact exercise in peeling away superficial layers of civility to expose evil at play. Riffing on themes from The Stepford Wives but with the extra specter of insidious racism, Get Out enjoys a strong ramp-up, Peele focussing on building cerebral and creepy tension as Chris stumbles onto a not-quite-right world of large homes, white owners and creepy black people. Once the conspiracy takes flight, the film flips to a more gory mode, and the final third is more routine and less interesting. Get Out works as a metaphor for the dangers of liberal views disconnected from actions, where the soothing spoken words are a cover for dangerous intentions. The film also fits as a summary of the black experience in America, Chris journeying from his supposedly wild urban habitat to the seemingly more cultured suburbs, only to find unimaginable mistreatment hidden within the pretense of advanced civility. Aesthetically Peele makes frequent and unsettling use of some extreme close-ups, both Catherine Keener as Missy and especially Betty Gabriel as Georgina enjoying some mammoth zoom-ins to loom large over Chris' psyche. Caleb Landry Jones as Rose's slightly unhinged brother Jeremy contributes to the sense of dread. Daniel Kaluuya is sturdy as Chris, and the horror unfolds through his eyes, expanding from eerie encounters with Georgina to more shocking episodes of mind control and unwanted surgery. The rest of the cast does not stray from the conventional, and Peele flicks a switch rather suddenly to turn the environment and characters from scheming to outright demonic. Chris' adventure ends with bloody violence and plenty of corpses. The black man did not start this mess, but doubtless he will be held accountable for the resulting carnage.